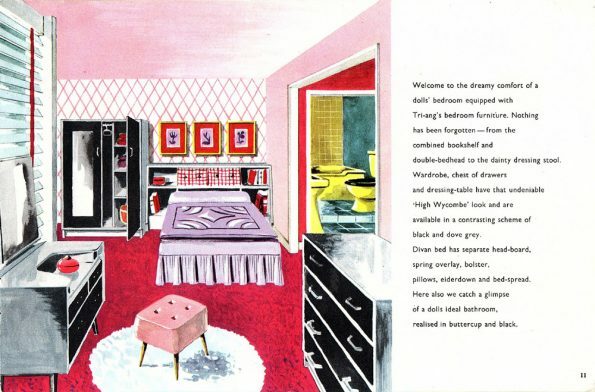 Welcome to the dreamy comfort of a doll’s bedroom equipped with Tri-ang’s bedroom furniture. 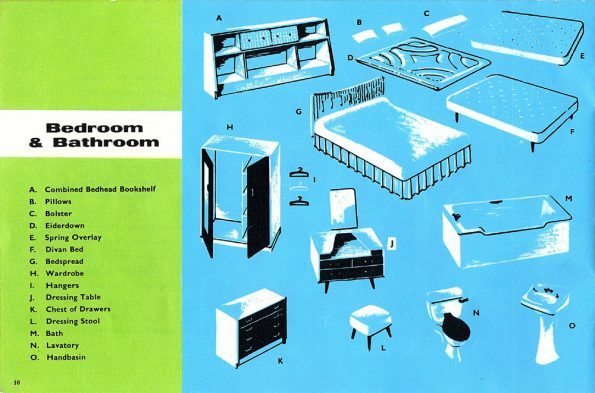 Nothing has been forgotten – from the combined bookshelf and double-bedhead to the dainty dressing stool. Wardrobe, chest-of-drawers and dressing-table have that undeniable ‘High Wycombe’ look and are available in a contrasting scheme of black and dove grey. Divan bed has separate head-board, etc. 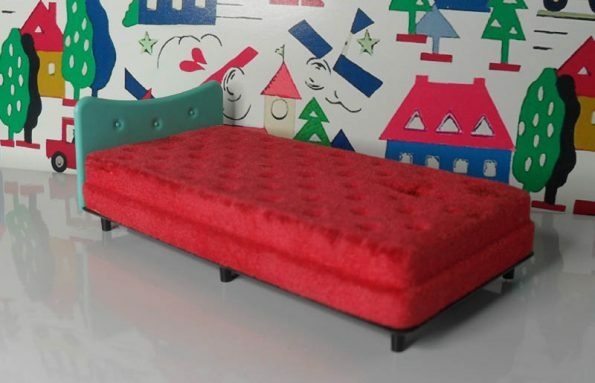 The bed comes is three parts consisting of a headboard, mattress, the base fitted with metal frame with short legs. 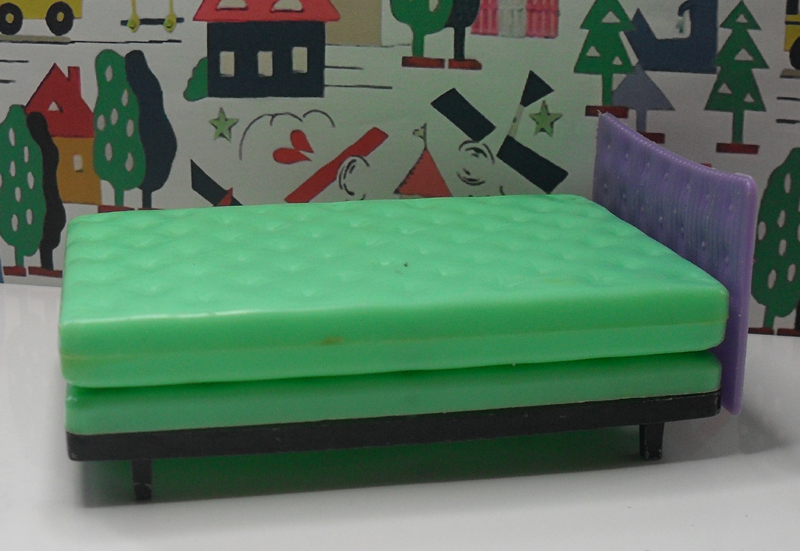 The beds and headboard come in various colours, red, light green, purple and light blue. 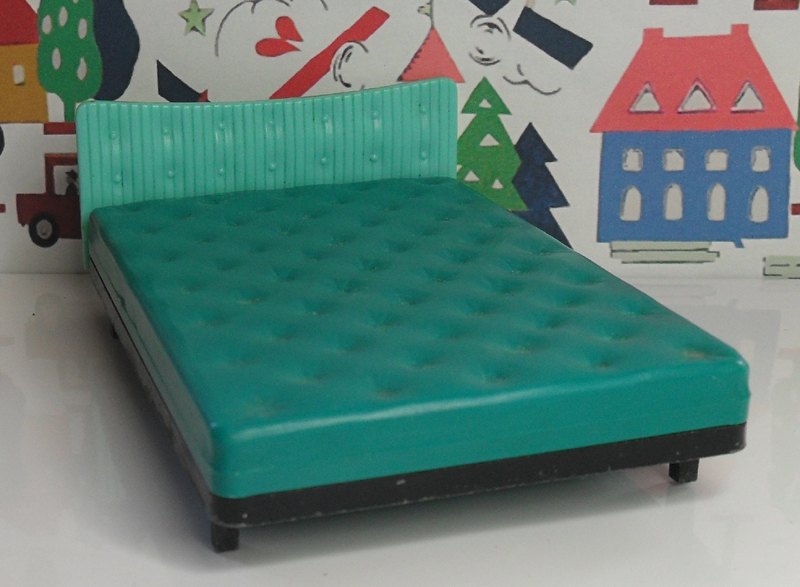 Jenny’s Home bed is a much more modern turquoise colour, with no added mattress on top. It is easy to tell if the bed is Triang or Jenny’s Home, as the headboard is two button spaces above the mattress. 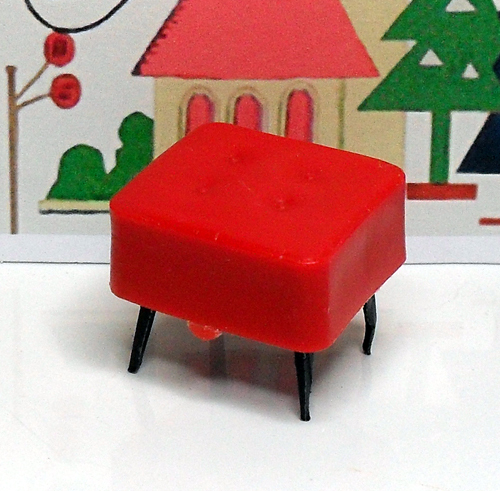 The red stool is made from moulded plastic with a metal base and thin legs, which fits deep inside. They are produced in various colours, red, purple, cream, light blue, pink and turquoise. 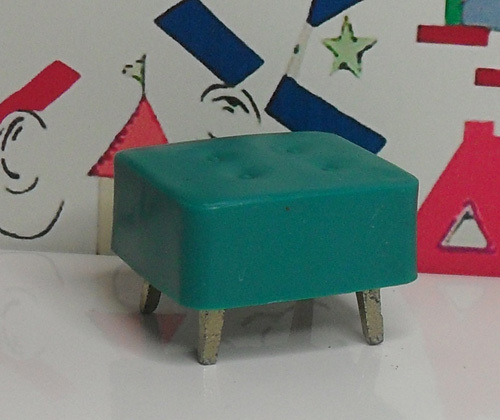 The Jenny’s Home Bedroom Stool 1011. the legs are now gold and not so pointed. 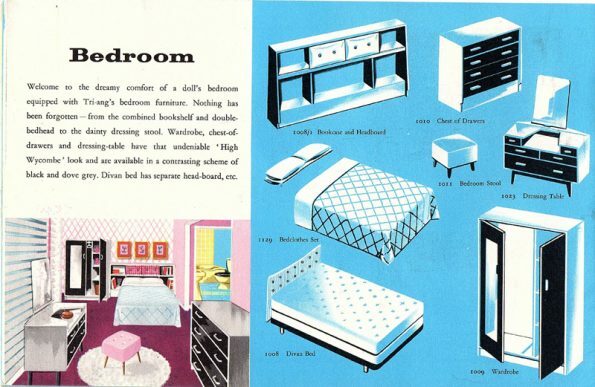 Welcome to the dreamy comfort of a dolls’ bedroom equipped with Tri-and’s bedroom furniture. Nothing has been forgotten – from the combined bookshelf and double-bedhead to the dainty dressing stook, Wardrobe, chest of drawers and dressing-table have that undeniable ‘High Wycombe’ look and are available in a contrasting scheme of black and dove grey. Divan bed has separate head-board, spring overlay, bolster, pillows, eiderdown and bed-spread. Here also we catch a flimpse of a dools ideal bathroom, realised in buttercup and black. 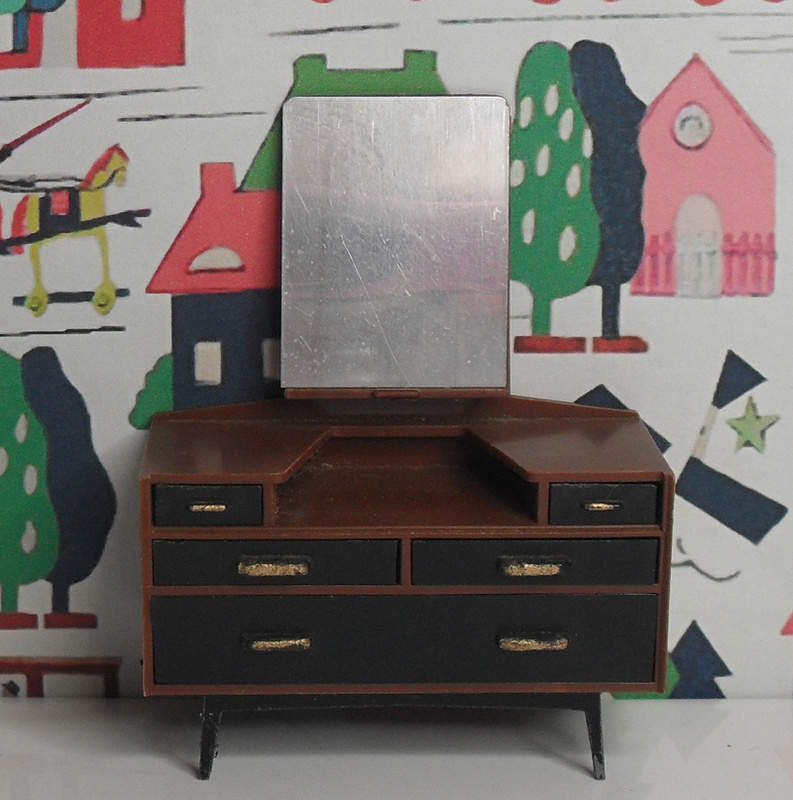 The Dressing Table was produced in the style of G Plan, the colour mainly [Tola and Black range]. 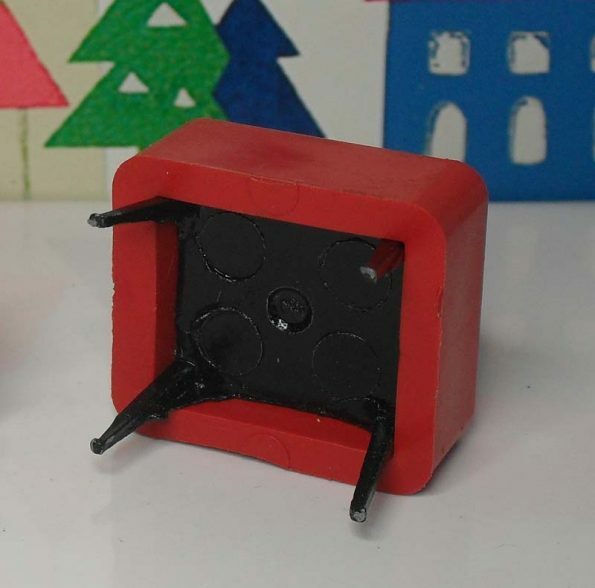 It was made of moulded plastic with two large drawers and two smaller ones. The early mirrors did not have a frame around them. 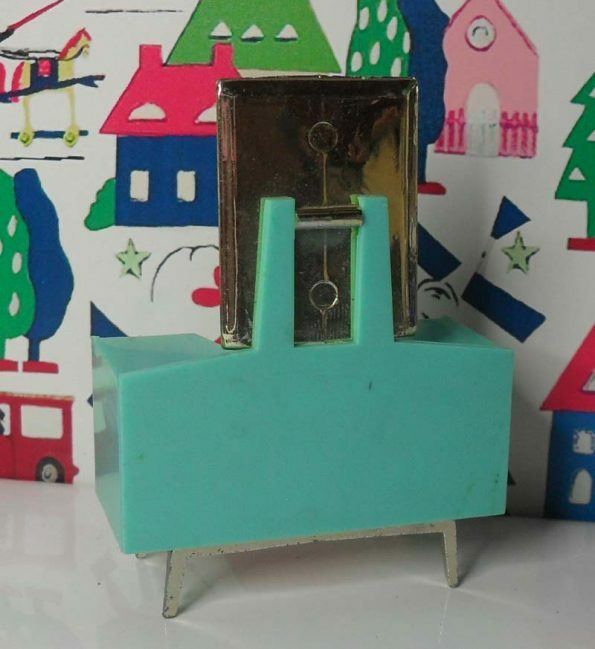 The picture above shows a later model with a brown edge around the mirror. The picture below showing a mirror with no brown edge. 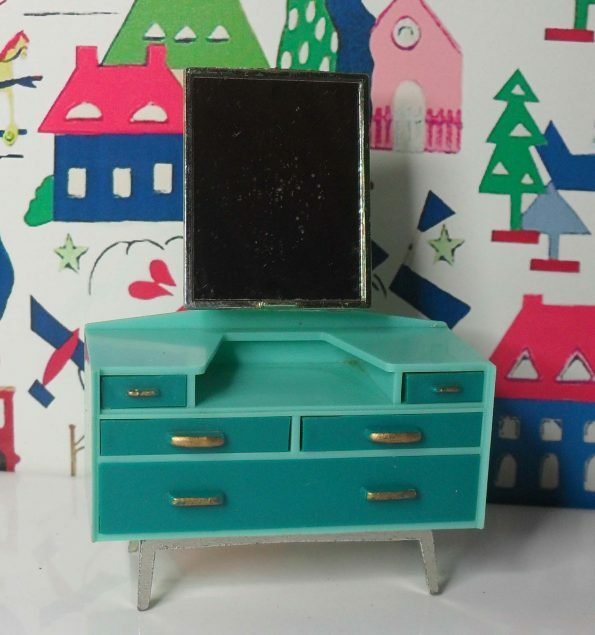 Jenny’s Home Dressing Table in a modern two-tone turquoise colour. It now has less pointed legs, which are now painted gold, as is the mirror. 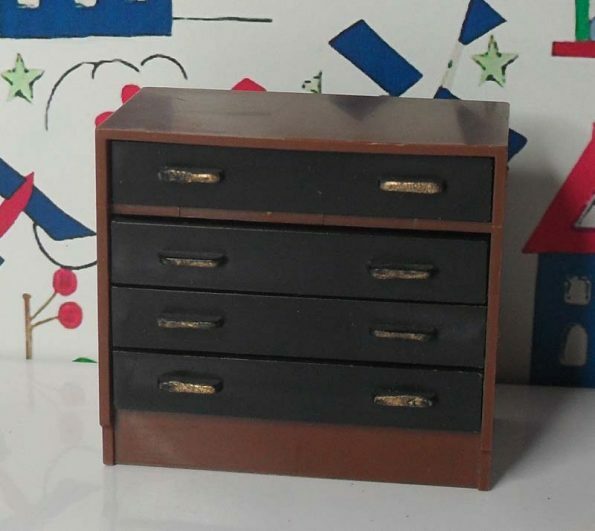 Also in the style of G Plan’s Tola and Black range, the chest of drawers above is a brown surround with black drawers. 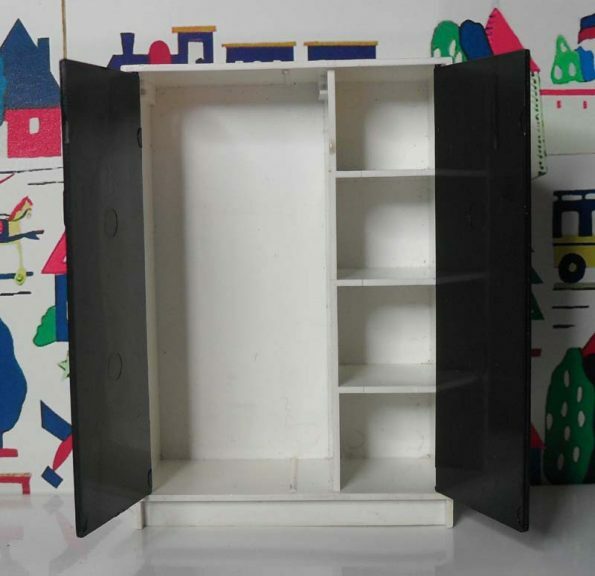 The above chest of drawers has a white frame with black drawers, as in the picture in the catalogue above. 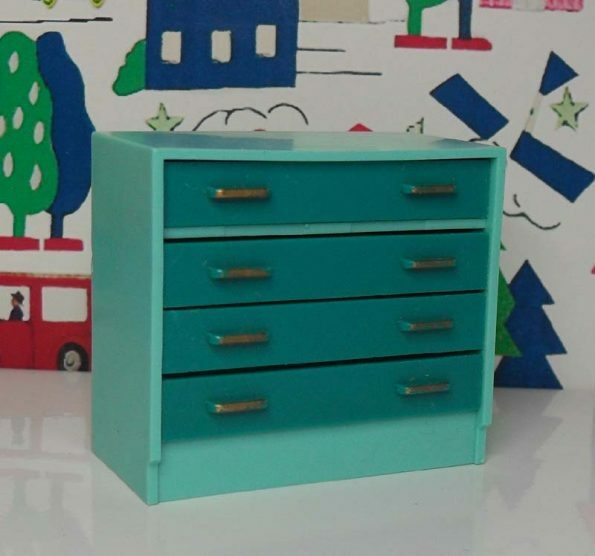 This is the Jenny’s Home version of the Chest of Drawers, in a modern two-tone turquoise colour. 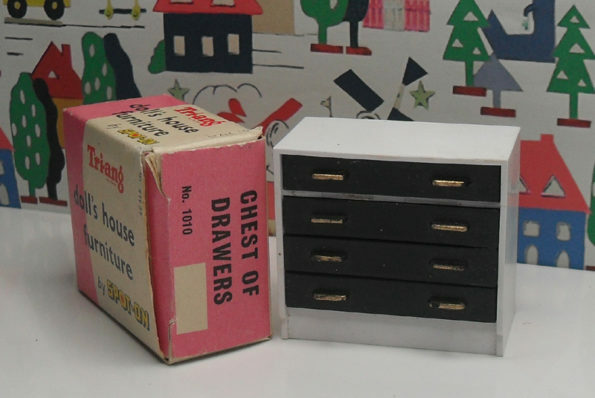 This chest of drawers came in a blister pack with a matching bedroom stool. 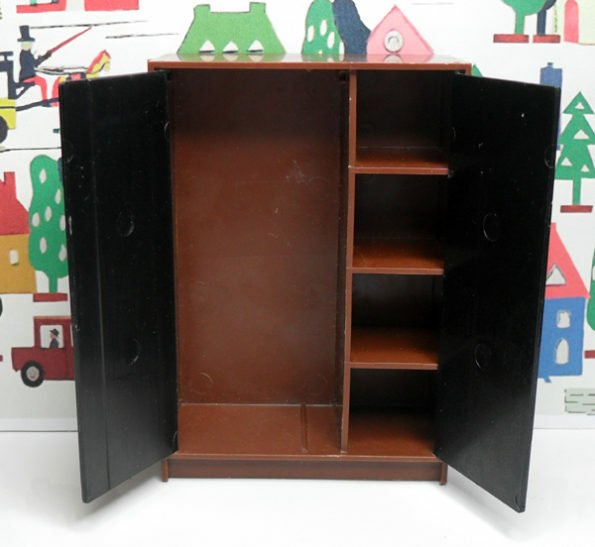 The wardrobe is all plastic with a brown frame with black doors which open, on small tags at the top and bottom. There is also a mirror on the left hand door. 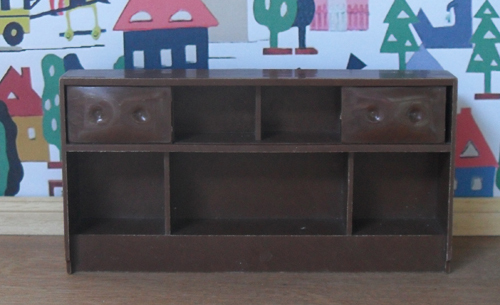 It also has a hanging rail on the left hand side, with a row of shelves on the right. 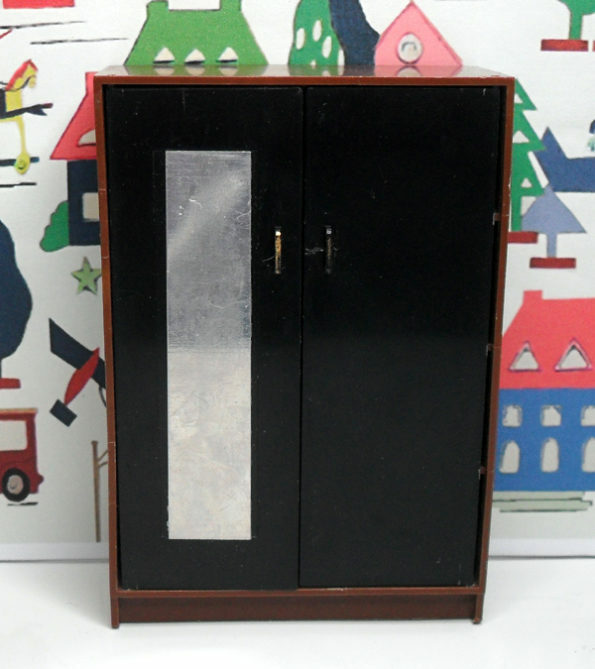 Triang Black and White Wardrobe, this is like the one shown in the 1960 and 1961 Catalogue. 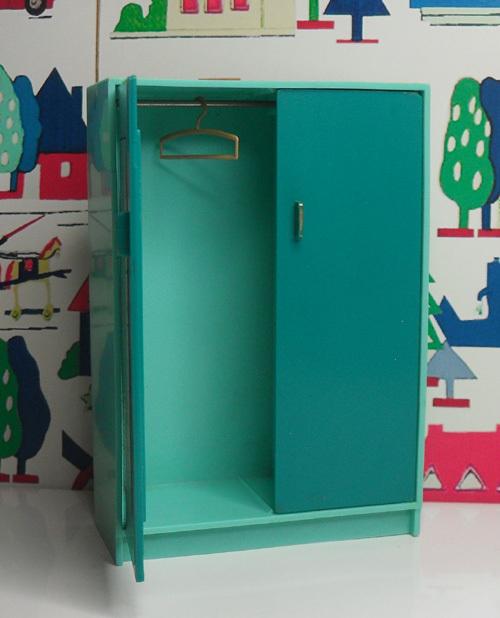 This is the first of the new range of wardrobe in the Jenny’s Home Range, in a lovely modern two-tone turquoise colour. 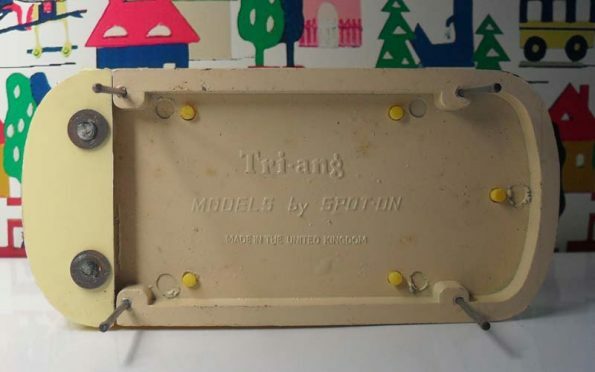 It has small plastic tags for the doors to open, as in the original Triang Range, these easily break. 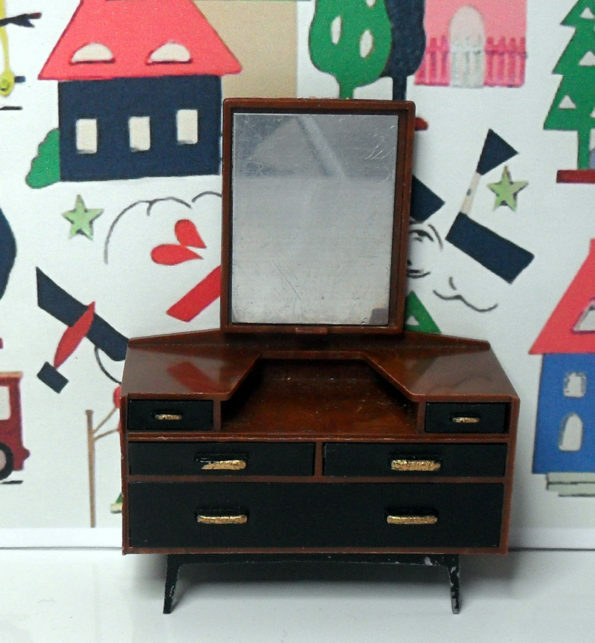 The mirror on this wardrobe is showing its age, or is it a little distressed. 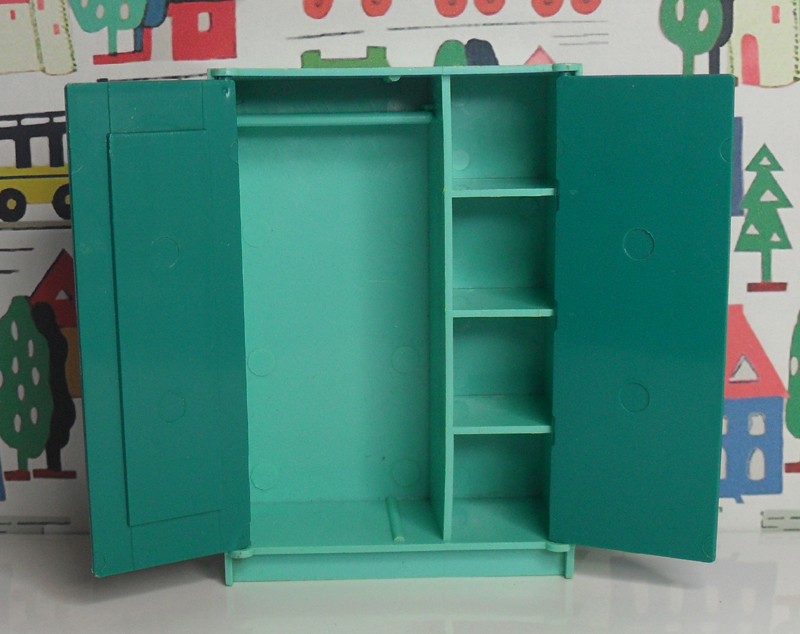 The new colour wardrobe is the same one in side, with a hanging rail and shelves. 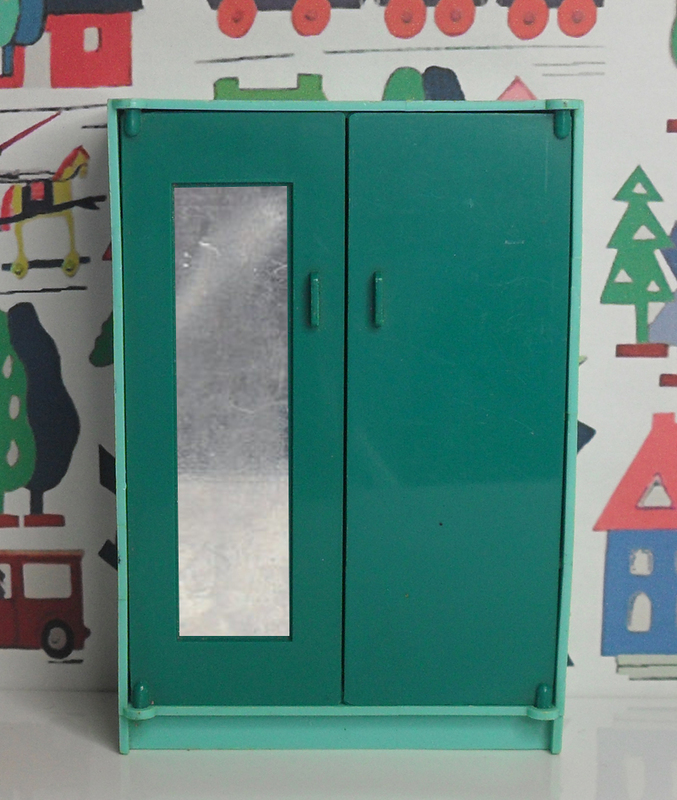 Inside this wardrobe there is A Little Hidden Treasure, an original coat hanger. 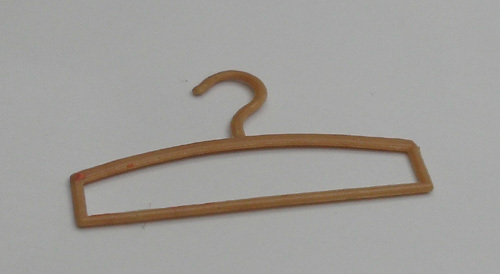 The coat hanger is an inch long across the bottom, it is so thin I am surprised it survived. These  would be packaged with the wardrobe, or sold separately. 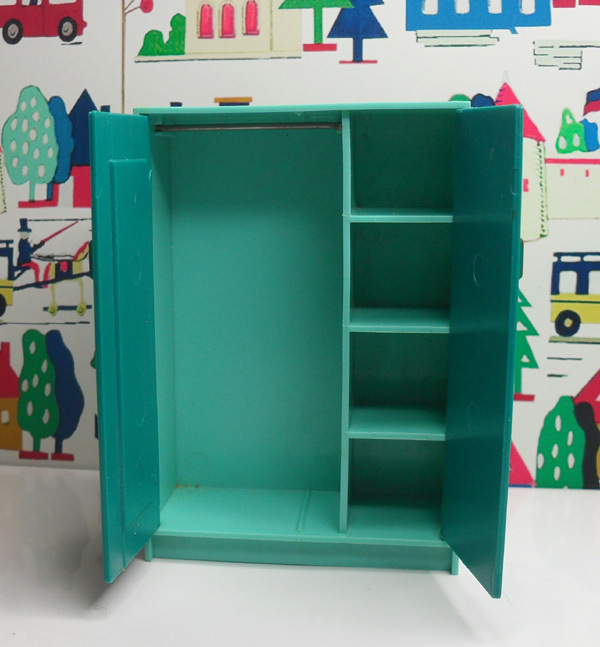 Jenny’s Home wardrobe in a modern two-tone turquoise colour. 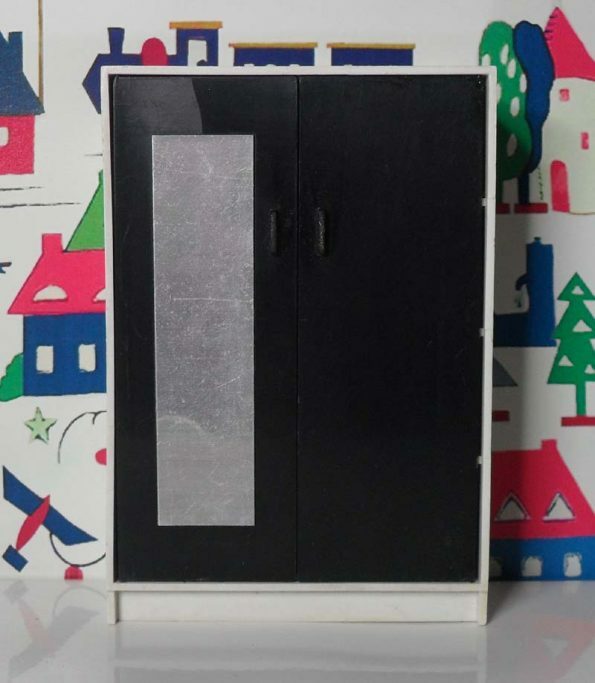 The tabs which alow the doors to open are also a lot more practical and less likely to break during play. The hanging rail that was in the original Triang wardrobe, has now been changed to a small shelf, otherwise it is the same. 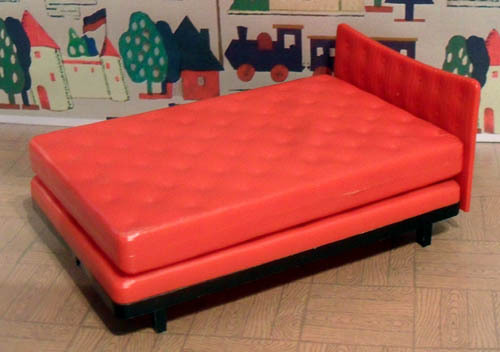 This headboard is a quite strange piece of furniture, because the bed without a headboard, just sits in front of it. But, as a bonus the two panels at the top slide. 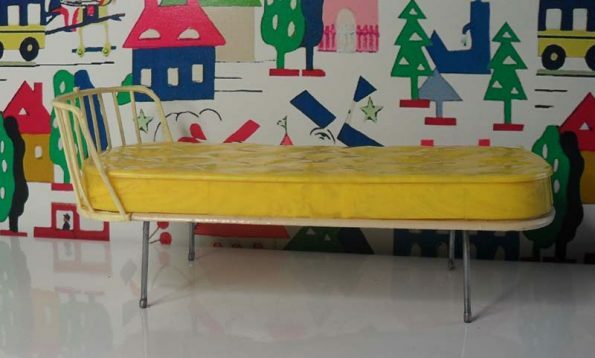 The single bed is made in the style of Ercol, a British furniture manufacturer. This is quite a complicated piece of furniture with the plastic mattress, actually fitted over a pressed metal frame. 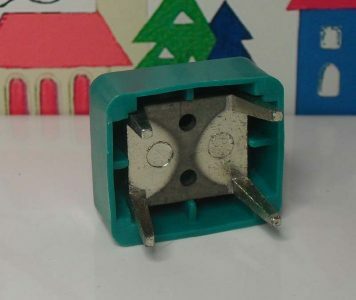 The bars at the end are fitted onto a plastic base, which is then attached to the metal frame. You can see how it all goes together in the picture showing the underside of the bed. The legs are also metal. The single bed is one of the few pieces of furniture that is marked as being Triang, although it has not model number on it. Showing the underside of the bed. 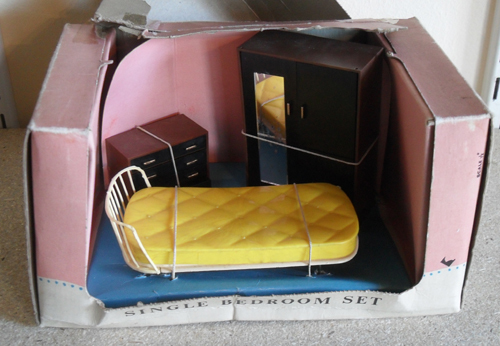 I love my Single Bed Set, I was very lucky to find it, the box is a bit delicate. 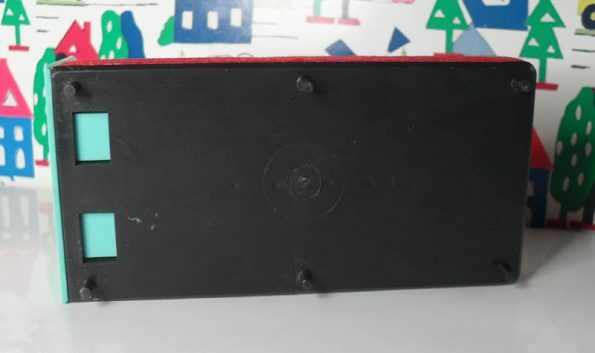 There is also a brown sleeve that goes around the box. 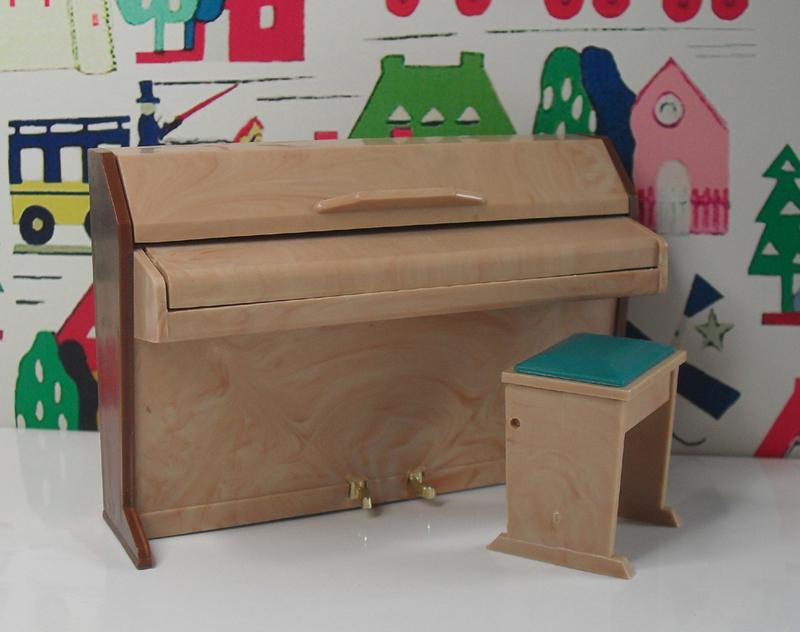 The Set consist of Wardrobe 1009, Chest of Drawers 1010 and Single Bed 1036. It’s a truely ’60’s look. 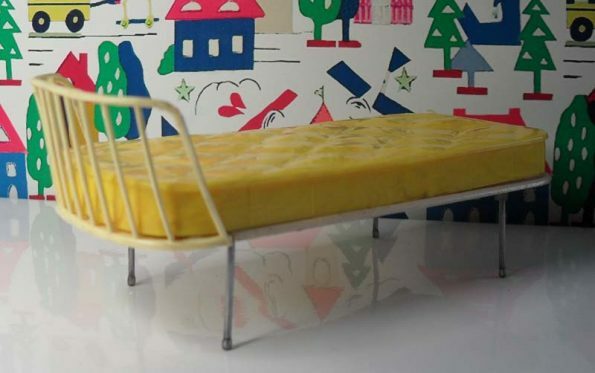 I like the way they modeled the mattresses but left it up to you whether to make fabric bedding. The bedding was sold separately and is difficult to find.